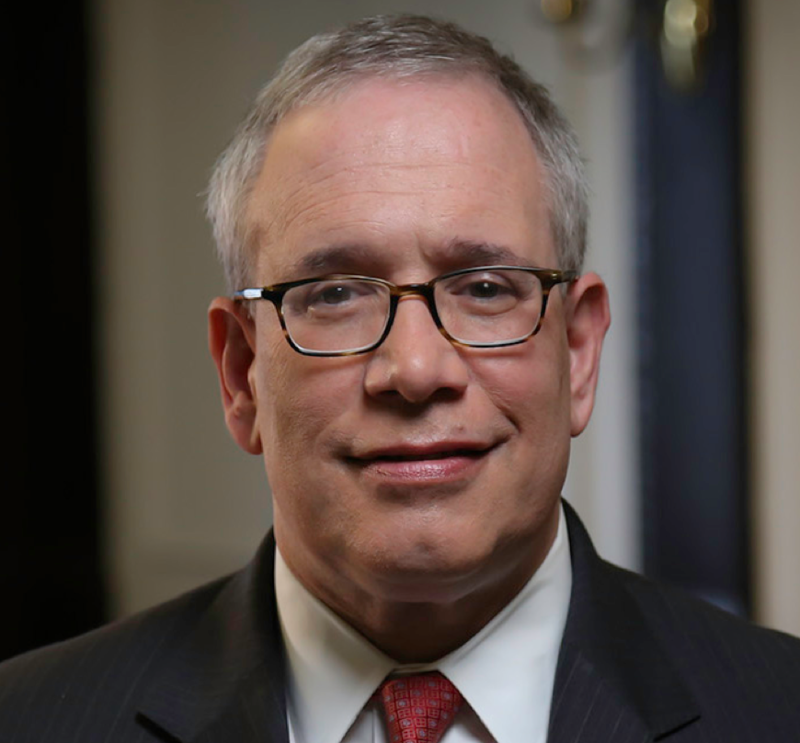 Taxpayer-funded pension contributions in New York City will rise $732 million above previous projections between fiscal years 2018 and 2020, following paltry investment earnings in the recently concluded 2016 fiscal year, City Comptroller Scott Stringer has just disclosed. During the year ending June 30, the pension funds earned a combined investment return, net of fees, of just 1.46 percent—well short of the funds’ assumed (i.e., ardently hoped-for) return of 7 percent. As a result, compared to projections in Mayor Bill de Blasio’s just-adopted financial plan, pension contributions will need to rise by another $122 million in 2018, $244 million in fiscal 2019, and $366 million in fiscal 2020, Stringer said in his comments on the adopted budget for fiscal 2017. The comptroller is the custodian of and investment adviser to the five separately governed municipal pension funds for police officers, firefighters, teachers, and other employees. The experience of New York City’s funds, collectively valued at more than $163 billion, is similar to those of other large public retirement systems with the same fiscal schedule—including the $183 billion California State Teachers Retirement System (CalSTERS), which also reported a 1.4 percent return for fiscal 2016. The massive California Public Employees’ Retirement System (CalPERS) reported a net gain of just 0.6 percent for the same period. New York State’s Common Retirement Fund, which feeds the New York State and Local Retirement System (NYSLRS), reported a gain of just 0.16 percent for its fiscal year, which ended March 31. 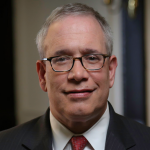 Stringer and state Comptroller Thomas DiNapoli, the sole trustee of the state fund, both report their investment returns on at least a quarterly basis and also have produced prompt preliminary estimates of annual returns. By contrast—inexplicably—the New York State Teachers’ Retirement System, whose fiscal year ended June 30, customarily does not disclose its annual results until the fall. As first predicted here almost a month ago, the most recent fiscal year was a bad one for public pension funds across the country, because virtually all of those funds are heavily invested in domestic and global stock markets that performed poorly for over a year now. In fact, the latest year’s losses came on the heels of sub-par returns in fiscal 2016, as well. As the Wall Street Journal reported this week, long-term returns for public pension funds have now fallen to the lowest levels on record. So in two more fiscal years, the city’s pension contribution will hit a whopping $10 billion—11 percent of projected city expenditures, and 17 percent of projected city taxes, as illustrated in the chart below. The city’s fiscal 2017 pension contribution will be nearly seven times the level inherited by Mayor Michael Bloomberg when he took office in 2002. The increase over the past 15 years—from $1.4 billion in Rudolph Giuliani’s last budget to $9.3 billion last year and projected $10 billion in 2019—reflects both benefit increases and sharp market losses. A few years ago, the city began a phased-in reduction of its assumed return, to 7 percent from 8 percent—but even at 7 percent, it is unrealistically high to serve as the basis for valuing liabilities that are constitutionally guaranteed and virtually free of risk for beneficiaries. More recently, the pension fund has adjusted actuarial assumptions to reflect longer expected life-spans of current and retired city employees. Thanks to (predictably) lousy FY 2016 returns, NYC pension costs will rise another $732 million by 2020. 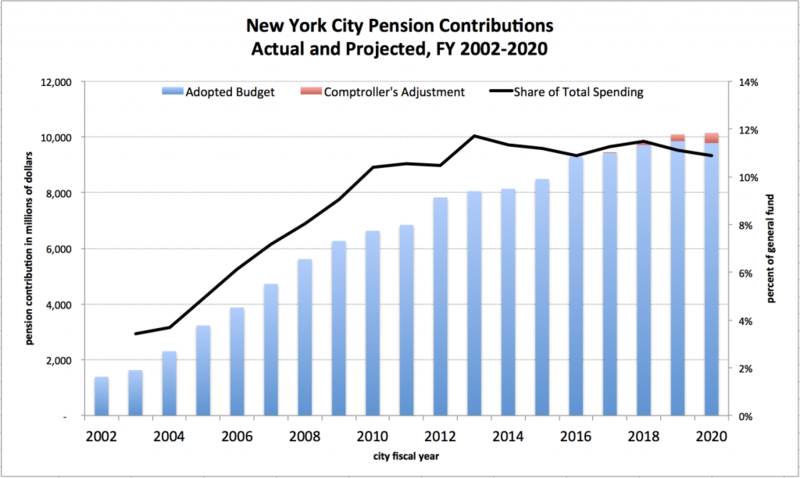 NYC's tax-funded pension contribution now projected to hit new milestone of $10b in two more years.